The UniForce 6 is a travelling column machine, which – thanks to its robustness and strength – is particularly suited for large work pieces. Extremely flexible and precise over long travels, it is also suitable for tool making as well assingle item and small batch production in mechanical engineering. The machine concept enables bulky and complex components to be machined in one set-up. 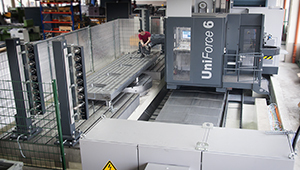 The UniForce 6isequipped with universal milling head of orthogonal design.